A stray shower or thunderstorm is possible early. Sun and clouds mixed. High 81F. Winds N at 5 to 10 mph..
A stray shower or thunderstorm is possible early. Partly cloudy skies. Low 56F. Winds light and variable. Meet Tucson artists and get a glimpse at their creative process at this local-only market happening along Fourth Avenue. Where: 311 E. Seventh St. When: Sunday, March 31, 10 a.m. to 5 p.m. Cost: Free to attend, but bring some money for some shopping fun. Shop a three-day sale with a variety of peppers, tomatoes, eggplant, basil and other tasty greens. Nighthawk Natives Nursery will be there with plenty of wildflowers and landscaping plants to choose from. As usual, members get 10 percent off their purchase, new or renewing members will get 15 percent off. Where: Native Seeds SEARCH, 3061 N. Campbell Ave. When: Friday-Sunday, March 29-31, 10 a.m. to 5 p.m. Cost: Free to attend, special shopping hour for members will be Friday, March 29, 9-10 a.m.
Make a memory with friends and family and send it off into the luminescent water. The Water Lantern Festival brings people together in a magical night with food and music. When: Saturday, March 30, 3:30-9 p.m.
Kick-off spring with a party in Sahuarita. Festivities include water park (food donation), live entertainment, free t-shirts, ferris wheel, parade, foam pit, vendors, food trucks and get a little dizzy on the the Gyro Spin ride. When: Saturday, March 30, noon to 6 p.m.
Archery Expo Day gives archers and those interested in learning a bit more about the sport the opportunity to enjoy a day at the range. Get basic archery instruction, walk around archery course, 3D archery shoot with Pusch Ridge Archers, food trucks and vendor booths. The Southern Arizona Blues Heritage Foundation is throwing its 34th annual festival this year. Join in on the celebration with local performers like Canned Heat, Dennis Jones. R. D. Olsen, Tucson Jazz Institute and more. While you're getting your fill of good soulful music, check out the crafts, beer and food vendors. When: Saturday, March 30, 10 a.m. to 6:30 p.m. Cost: $20 if you buy in advance, $25 at the gate or $100 for VIP. Touchdown! Cheer for your new city team in a action-packed game played on a turf field the size of a hockey rink. Plus, no sunburn — it's indoors. Where: Tucson Convention Center, 260 S. Church Ave. When: Sunday, March 31, 3 p.m.
Bookmans has teamed up with PACC for a paw-tastic event. Adoption fees will be waived for this event. So, basically a free furry friend and all you have to pay is the $18 license fee. Where: Bookmans Midtown, 3330 E. Speedway Blvd. When: Saturday, March 30, 10 a.m. to 2 p.m. Cost: Free, but bring $18 if you find a pup to take home. Enjoy the spring air and check out your local artists. This two-day festival features 150 artists and exhibitors, live musical performances, food vendors and family arts activities. When: Saturday-Sunday, March 30-31, 10 a.m. to 5 p.m. Celebrate Marana's past and future with a parade, food vendors, inflatables, performances and more. Where: 13395 N. Marana Main St.
Get an early start on your Easter egg hunting with a free hunt at Quincie Douglas Park. Enjoy food, drinks, arts and crafts and face painting. When: Saturday, March 30, noon to 3 p.m.
Join a sing-a-long with Mr. Nature and friends and then stroll through Mildred & Dildred's whimsical toy shop. Take your kids for some stretching good time at the museum this weekend. Kids are welcome to join a silly morning of movement, flow and poses like the animals. Don't forget to bring a mat or a towel for your little yogi. When: Sunday, March 31, 10-10:30 a.m. It's Lego time! Build, stack and create with fellow Lego fans this weekend. Legos are supplied by the library and all ages are welcome to attend. Where: Nanini Library, 7300 N. Shannon Rd. When: Saturday, March 30, 3:30 p.m. Enjoy a relaxed flow class with twists, balancing and back strengthening and wind down. Remember to bring your mat and towel. When: Saturday, March 30, 1 p.m.
Join a yoga/pilate fitness pop-up class at Caps and Corks. The class includes one draft beer or a glass of wine. Remember to bring your yoga mat, water and towel to the class. When: Sunday, March 31, 10-11 a.m.
Get some shopping done downtown and add some unique clothing or collectibles. The MSA Annex will have live music, on-site restaurants and food trucks. When: Friday, March 29, 6-10 p.m. Cost: Free to attend, but bring some money for some shopping. Indulge yourself with free workshops, seminars, activities, life and love coaching, speakers, psychic reading and exhibitors. After you had your fun with the girls, take you chances at the casino. When: Saturday, March 30, 9 a.m. to 4 p.m.
As if, you were thinking of skipping out on a popular 90s flick. Reminisce with the girls from Beverly Hills. When: Friday and Saturday, March 29-30, 10-11:45 p.m.
Jim Henson's puppets have taken the stage to bring you excitement and laughter. Turn back the clock and watch this popular 1980s film. Plus, Pop's Hot Chicken will be parked right outside. When: Friday, March 29, 7-9 p.m.
Time to get your scare on with twelve non-stop hours horror classics this weekend. Watch Psycho, The Blob, Candyman, Society, Train to Busan, The Howling and Two Thousand Maniacs. In addition to the event, don't miss the scary shorts, trashy trailers, trivia games and prizes. Substance Coffee Diner food truck will be here from 11 p.m. to 2am. 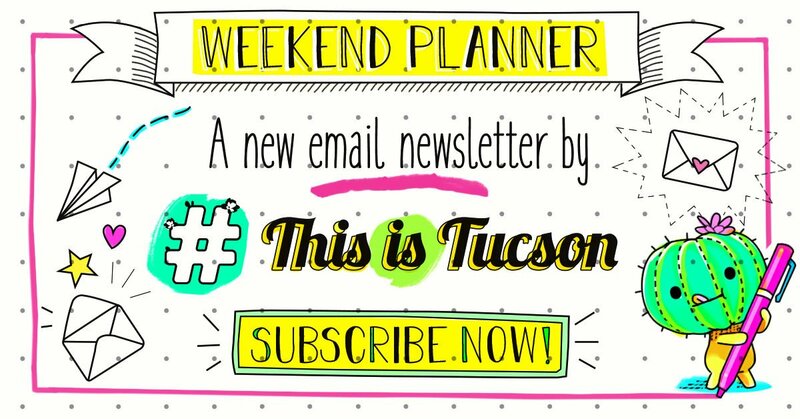 When: Saturday, March 30, 7 p.m. to Sunday, March 31, 7 a.m.
Find some things to do in Tucson, Oro Valley, Marana and Sahuarita without spending a dime this month. There are now 48 Buffalo Exchange stores around the country.